Kenworth’s T880 set-forward-axle version is usually seen with a dump or ready-mix body, but this one was set up for highway operation. 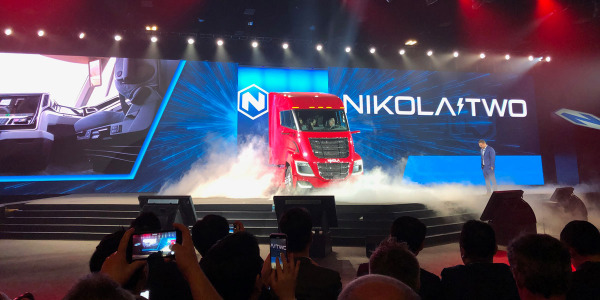 It’s not often we get what reporters call a scoop on a test drive story, but that’s what this is: the first test drive of a rather unique truck that I predict will soon not be so unique. Kenworth says there are only two like it on the planet, and I found one while wandering through a small regional truck show near Montreal, Quebec, last summer. I spotted the gorgeous red Kenworth among the rows of trucks and immediately did a double take. It wasn’t the bold red paint job or the big 76-inch sleeper that caught my eye; rather it was the set-forward steer axle and squat brawny frontal profile of a T880S. Kenworth offers the T880S variant mostly as a vocational chassis for heavy operators like the dump or ready-mix sectors who need the extra few inches of axle spacing to meet the bridge-law requirements in some states. I really didn’t expect to see one equipped for on-highway operation with a 76-inch sleeper. 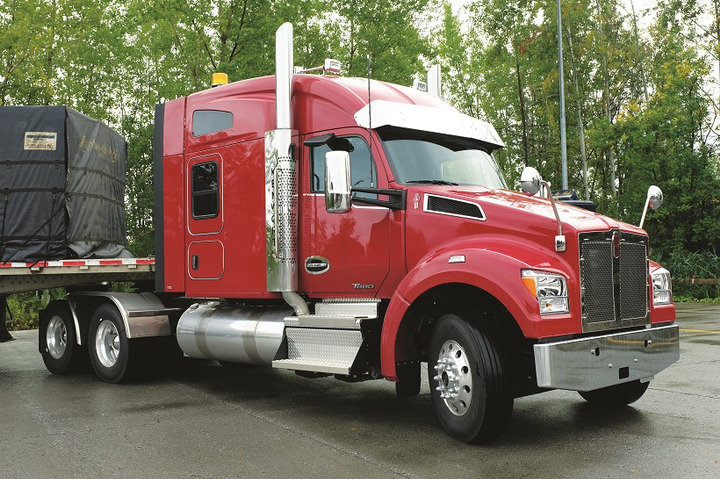 Comparing the set-forward axle T880S to other models, the bumper-to-back-of-cab (BBC) measurement is 114 inches, which is about 2 inches less than the short-hood T880. The center of the wheel spindle is about 20 inches further forward on the T880S than the short-hood T880 with the set-back axle. Its sort-of predecessor, the W900S, has a 120-inch BBC. 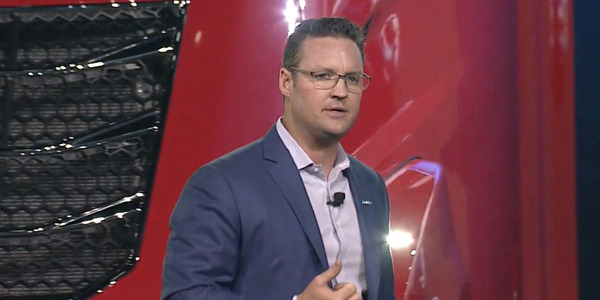 Daniel Paquette, the business development manager at Kenworth Montreal, spec’d and ordered the T880S for dealer stock after several customers requested he bring one into Montreal so they could have a closer look. “They liked the tough, brawny look of the short hood and the set-forward axle,” Paquette told me. 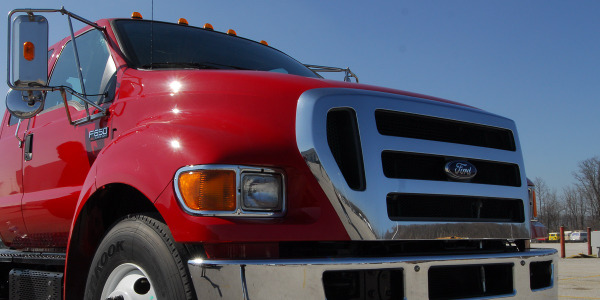 As highway trucks go, this one is a curious mix of rugged and comfortable. This T880S has just about everything a well-appointed over-the-road truck would have, like the Diamond VIT interior, full gauge package, swiveling passenger seat and swing-out table, drawer-type fridge, as well as wiring for a microwave and an inverter. It has the Extreme Temp insulation package and a fuel-fired cab heater, too. Underneath all that sits a really robust chassis, somewhat typical of a heavy-spec’d vocational truck, such as the 2,132,000-pound RBM frame, heavy-duty crossmembers, 14,600-pound front suspension, and a 46,000-pound rear suspension with heavy-duty air springs. 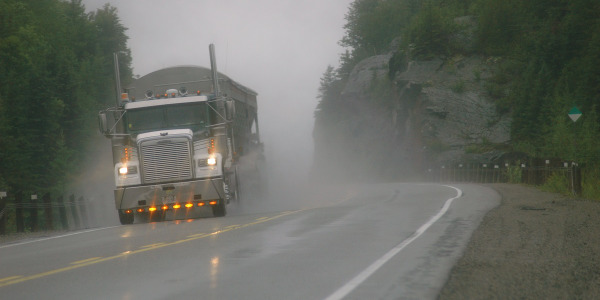 Highway conditions in the province of Quebec are not quite like the Interstate highways we are familiar with in the U.S., and much of the roads in the northern parts of Quebec and Ontario are two-lane and not in the best of shape. Couple that with the very generous weight allowances in eastern Canada, and the need for a heavy-spec truck that can take a pounding becomes evident. The load we had for the test scaled in at 114,960 pounds (Steer axle: 11,300; drive axles: 35,700; trailer axles: 67,960). 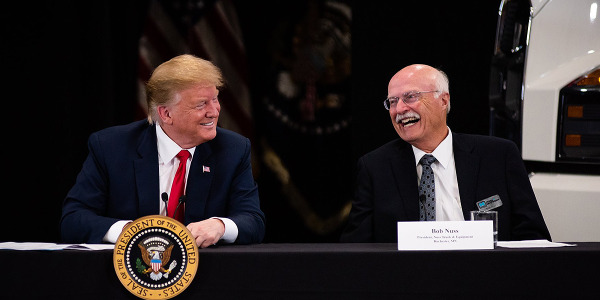 The allowable gross vehicle weight for that combination is 122,350 pounds, so we were comfortably under the wire. A thank-you is in order to Pierre Aubin of L’Express du Midi in Ste.-Catherine, Quebec, just south of Montreal, for loaning us the flatbed load of drywall for the test drive. It was a treat to get a Canadian-weight load to test drive a Canadian-weight truck. 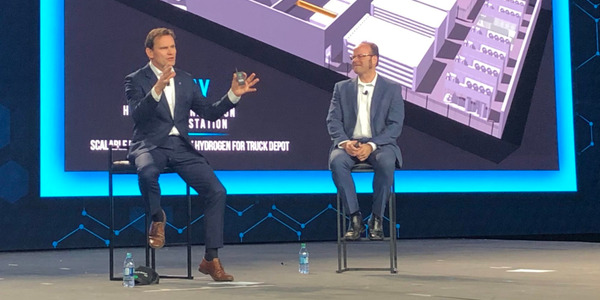 The truck is powered by a Paccar MX-13 engine cranking out 510 hp and 1,850 lb-ft of torque. 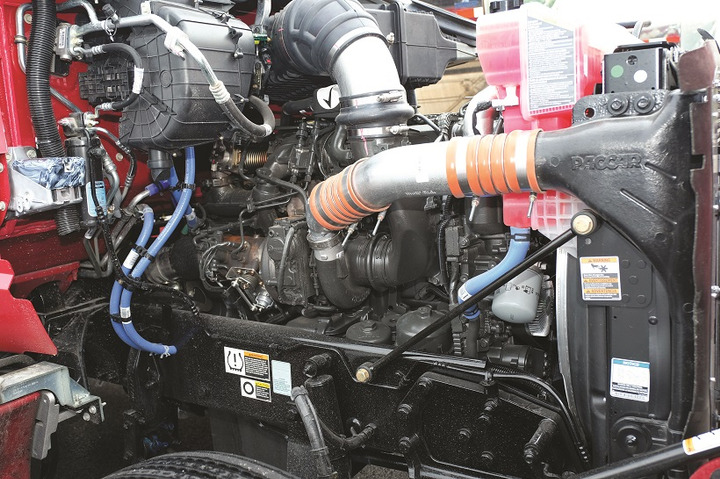 Paquette told me that many of his customers who run loads similar to our test load and even larger B-train loads prefer the 545- and 600-hp Cummins X15 engines with 2,050 lb-ft, but engineering can’t squeeze a red engine beneath the short T880S hood. But with its million-mile B10 life, two-year, 250,000-mile warranty, and a 300-pound slimmer profile, the MX-13 offers a lot in return for the bit of torque and horsepower it gives up. After arranging the test drive through Kenworth in Seattle and making plans with the dealership, Paquette and I bobtailed about 10 miles over to the yard in Ste.-Catherine to pick up the trailer. The 80-mile route took us around the west side of the Island of Montreal, over two bridges with decent approach grades and over some secondary roads where a bit of steering and gearing was necessary. 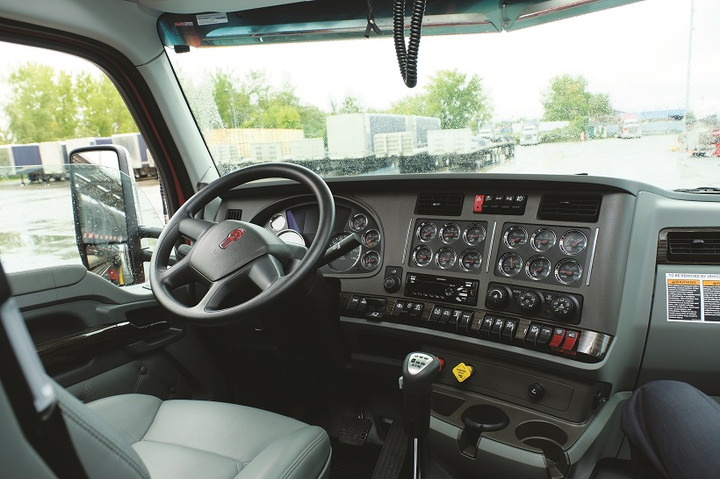 The cab interior has a full gauge package and top-of-the-line driver amenities like the Diamond VIT trim, swiveling passenger seat, and a premium sound system. Two features of the T880S struck me before we had even left L’Express du Midi’s yard: the maneuverability and the visibility. From the driver’s seat the hood is almost invisible. That provides unprecedented visibility close to the hood, where pedestrians, bicycles and small beer-can cars like to hide. The top of the hood at the center is barely chest high, so anyone over 4 feet tall would be easily seen by the driver. On the right side, just ahead of the A pillar where tall flat hoods and air cleaners sometimes live, the view down to the side is very good. At a light with a car sitting alongside, its roof was hidden behind the pillar, but the hood and trunk were clearly visible. The wheel cut was a bit shy of 50 degrees, Paquette says, owing to the bulky TRW TAS 85 steering box, which is rated for 16,000 pounds. It provided slightly thick steering at low speeds but wonderfully solid steering out on the highway. My personal feeling is that set-back steer axles can wander a little, but this set-forward axle tracked the lanes like the truck was on rails. Construction on the Mercier Bridge has the lanes narrowed to about 10 feet, so the precise steering was appreciated there. I tracked right across the bridge about 6 inches from the barriers on the right with no stress at all. I don’t think Paquette was terribly worried either, sitting on the right-hand side and looking out over the Saint Lawrence River. Being a Kenworth, the interior was remarkably quiet. There was no wind noise coming in from around the doors, and the engine and transmission noise was very tame, and even pleasant. It’s funny how fast you get used to some things. Most of the trucks I’ve driven lately have had downsped powertrains, meaning that engine speed at 65 mph is in the 1,100-1,200-rpm range. This truck, with its 3.91:1 axle ratio, clearly spec’d for Quebec’s higher weight allowances, was turning about 1,450 at 55 mph. It seemed fast to me, but that put it right at the upper limit of the MX-13’s peak torque band (1,000-1,450 rpm). Given the weight we were pulling, I had to make fast downshifts as engine rpms began slipping down lower in the torque band. You lose momentum pretty quickly on a 4% grade at a gross weight of 115,000 pounds. Our test drive took us over the Mercier Bridge, and the new bridge over the Beauharnois Canal on Autoroute 30. Both bridges have pretty good grades and forced me to downshift with the MX-13, but I suspect I’d have to make that downshift even with the beefier 15L engine. The 18-speed transmission gives the driver plenty of latitude to keep the engine where you want it for road speed and torque. In those harder pulls, a rather noisy engine fan spoiled the atmosphere a couple of times. The truck has a 1,330-square-inch radiator and a Horton on/off fan, which was obviously adequate for most of the driving we did. Maybe I’m just too used to the lighter American loads where engines don’t even break a sweat and fan noise is almost a thing of the past. I’ve saved the best for last here. The ride quality of this truck was sublime. The quality of the ride with the trailer on was unassailable — as solid and sure-footed as you’d expect, but more so. We had to bobtail from Kenworth’s headquarters in Saint-Laurent over to Ste.-Catherine to grab the trailer. That route takes you over some pretty rotten roads, but the suspension really took them in stride. I’m not enough of an engineer to explain it, but I put it down to having the suspension points at the extreme ends of the chassis — there’s no overhanging weight to keep the springs bouncing. It could also be the heavy front and rear suspensions, which you might be inclined to think would provide a rougher ride. I’d call it a stiff ride, but as smooth as I’ve ever felt in a big truck on deteriorating highways. As well, the cab suspension air springs and shocks sit 6 to 8 inches outboard of the frame rails. That wide stance helps discourage cab sway, which can also lead to a wandering steering wheel. The set-forward axle leaves loads of room for service technicians to stand alongside the 510-hp MX-13 engine. I can see this truck with similar specs doing well in a heavy-haul application in the states. With the large rear suspension and 3.91 gears, it’ll take 100,000-pound-plus loads in stride. The shortish 244-inch wheelbase also gives it a bit of a maneuvering advantage over the W900. 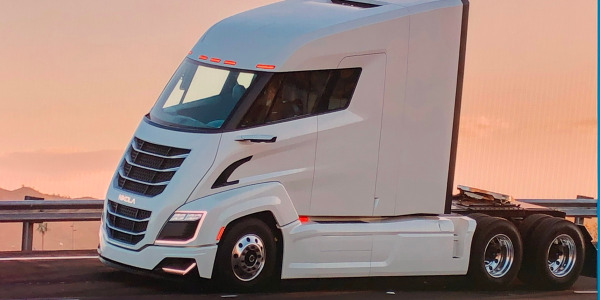 I could see it become an alternative to the T680 in more severe highway applications where aerodynamics takes a back seat to ruggedness. 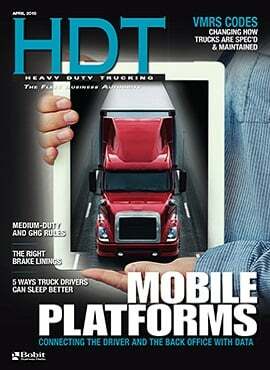 Clearly, it’s too much truck for a typical truckload linehaul job. Down-rated, though, with lighter running gear and more suitable gear ratios, it could be popular with style-conscious operators. The thing looks amazing with the twin exhaust stacks, chrome bumper and stainless steel sun visor. 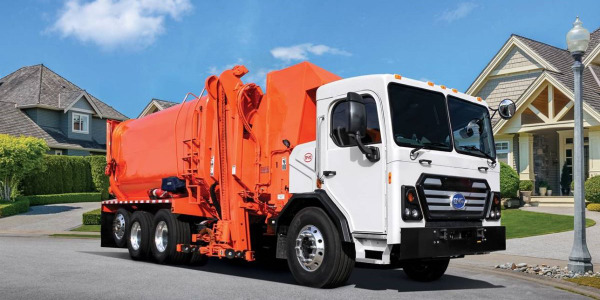 There’s a lot of good stuff going on with this truck, such as the large rear deck with wide unobstructed access from the right and left sides, an amazingly easy-to-open hood, and the vast amount of room technicians have when servicing the front end of the truck. With the axle positioned as far forward as it is, you can actually walk back and forth beside the engine. 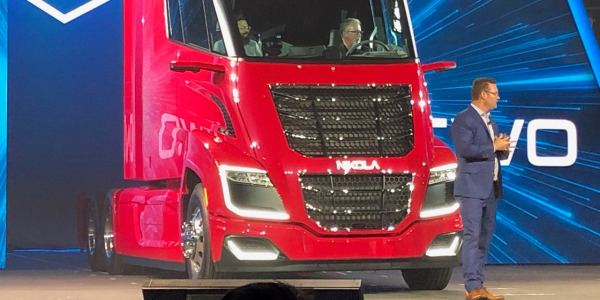 It was a pleasure driving this fairly unique truck for a few hours, and as I indicated earlier, I think we’ll soon see more of these on our highways. For fans of set-forward axle tractors, it’s a really nice compromise from the long-hood W900. And I’m sure Daniel Paquette and I are not the only people who will tell you, it’s just got a certain look about it that really catches the eye.